A DFS tool that lets you create multiple optimized lineups for the big DFS sites. They call it their ‘Lineup Cruncher’. They work for all the major sports and at the big DFS sites. The biggest thing they have is their ‘lineup cruncher’. It lets you build and optimize mass entry lineups. You tweak projections, like / dislike players, create any stacking rules you want and FC makes the lineups fit. FC puts together dozens and dozens optimized lineups based on your input. It user friendly with thumbs up and downs on players. It was built organically as a tool a DFS player needed himself and opened up to the Reddit DFS community. You use it by tweaking the projections for players. Set the guys you like to higher points projected and lower for the guys you don’t like. FC does the rest. FantasyCruncher puts together optimized lineups for mass entry players. It’s been called a must have for employing the mass entry strategy to win the big GPP. You want to drop 100 lineups in the quarter arcade? It’s by far the best tool for the job. Is it worth it? Up to you, of course. How Much does Fantasy Cruncher Cost? Season Pass – $109.95 one time payment for entire 2017 NFL season. If you aren’t sure you can try it for a month and cancel if you want. It’s easy to do so. If you like the tool and think it is worth it then by all means giddyap. It’s $29.95 per month for 100% full access. If you only want the lineup cruncher it is $24.95. With full access you get weekly articles with players to target and value plays, cash game stacks, bargin bin and a lot of weekly content. They make, liking/disliking players, building stacks, adding some custom rules easy. Ton’s of advanced options you can use too. Set how many unique players per lineup keeping your lineups varied but optimized. Set how many players max / min from each game every week. If you play GPP’s with a lot of lineups then this tool will work for you. It was super easy exporting lineups into Draftkings, even my technically challenged self could do it. I put 20 FantasyCruncher optimized lineups into the quarter arcade and one lineup I built myself without the optimizer. The FC lineups crushed my personal lineup. I had Derrick Carr as my QB and he sucked it up. Of course it was only one lineup but it ancedotal evidence up in here. There are a lot of advanced features you can use to build your team out. Position stacks – like QB paired with one WR from the same team. Team stacks where you can add players from opposing teams. So if you think it’s going to be a shootout then snag players from both sides and hope for the huge points stack. You can add groups of players that let you fine tune your lineups to work certain pairings of players together. You can work on your lineups as much or as little as you want. The projections they have are from their pro’s but you should tweak them to what you think. You pick some players you think are going to crush it or who aren’t likely to reach their ceiling and adjust your like/dislike and their projections. You put together all these rules and features and build mass lineups. You mass enter GPP’s with optimized, varied multiple lineups and start praying to the DFS gods that one of them takes it down. You can see defense V position on the players tab. You can see how many points Vegas thinks each team is going to score. You can sort by 15 different factors. There are different fields for Fantasy Crunchers projections and a a field for your own projections if you want to make them different. You can adjust your exposure settings to individual players if you want for max exposure when considering the player for the lineups. You can add up to three ‘thumbs ups’ and ‘ thumbs down’ to a player which affects how highly that player is considered in the lineup. You can lock players in and out of lineups. Likes and dislikes for players. You can build a ton of lineups and then tweak them all from there by clicking on the player you want more or less exposure to and adjust it. Then, recalculate. When you build a stacking rule you have to click the ‘add stacking rule’ button to apply it to your lineups. When building your lineups you can adjust players and percentages they are used in your lineups pretty easily. Easily generate dozens of lineups. The systems builds the lineups really fast. 20 lineups is built in 10-20 seconds and the first ones start displaying withing a second or two of calculating. This might be a little slower if you are doing this on Sunday mornings. 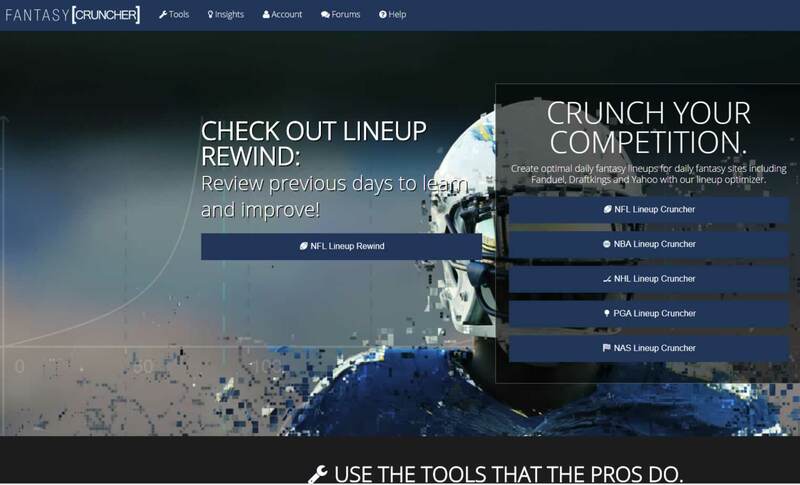 You can build lineups for Draftkings, Fanduel, FantasyDraft and Yahoo!. When you roll over the injured tag next to a player the injury info pops up automatically without having to click. I like that. Share, trash, save and download your lineups and or lineup easily. If you build your projections yourself and want to upload them, they have a tool for that. 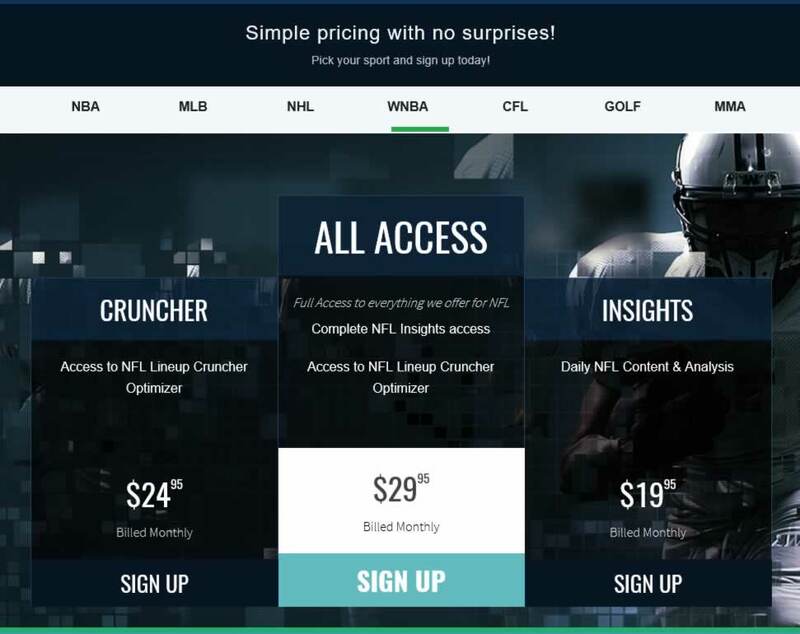 NFL, NBA, PGA, NAS, NHL, MLB, EURO Golf, CFL, MMA and even WNBA are supported with their lineup cruncher. Is Fantasy Cruncher Legit? Yes. Yes, buy it and try it if you want. Cancel anytime. They have maintained a positive reputation with their clients. They’ve been easy to work with from me as an affiliate and paid smoothly. Try it for a month, it’s $25 to use the lineup cruncher.